Reader, it is hot where I live. June, July, and August are tiresome months here, humid and warmer than what I became accustomed to in New England. After a year, I realized I’d had enough of trimming my hair myself. I texted a friend with good hair, and found someone to liberate my neck. Excellent, right? Well…it’s all good until you want to dress up. 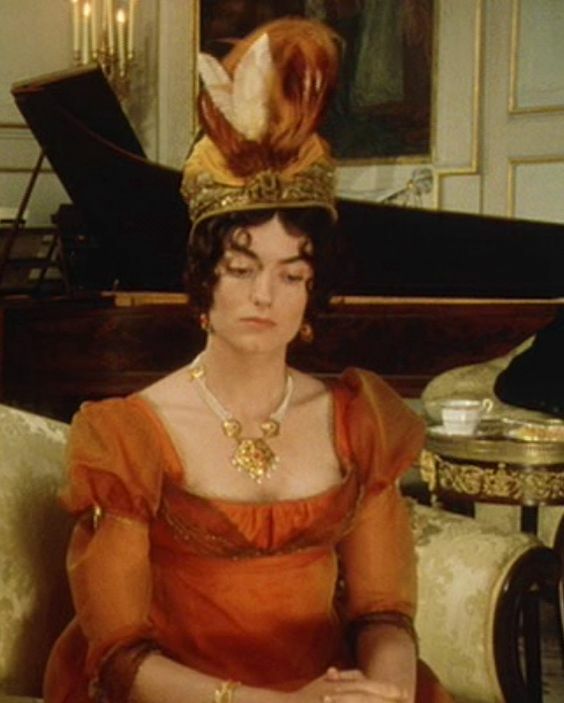 Lady Russell’s headdress, Persuasion, 1995. 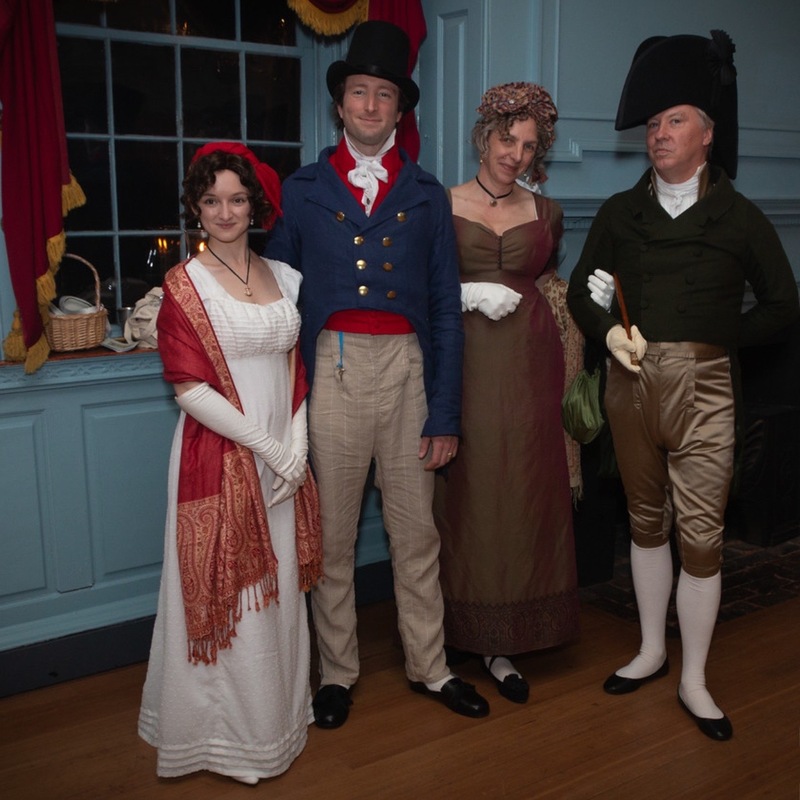 19th century history hair being somewhat mullet-like, my short in the back bob was not going to get the job done for last weekend’s Jane Austen Ball at Gadsby’s Tavern. What to do? 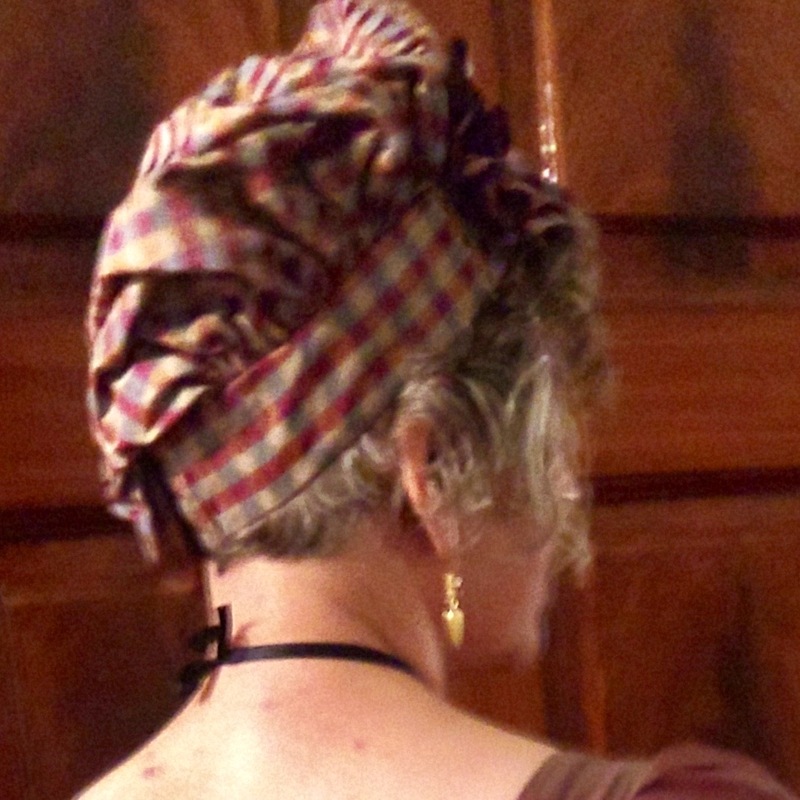 Cap it, of course– there’s no way I could figure out how to tie a turban elegantly and reliably without giving up the hope of finishing some other projects I really want to finish this month. So, a cap/hat/sewn headdress. Aside from the examples seen in film adaptations of Jane Austen’s novels, what evidence is there for these concoctions? Detail, Plate 11, April 1799 Journal des Luxus und der Moden. Enough, it would seem, to be getting on with. In addition to the 1804 Ladies’ Head Dresses plate, there are plates in the Journal des Luxus und der Moden showing headdresses and wraps, as well as an image of a pelisse and matching tam-o-shanter-like hat. These are simple enough to make, and I managed one in less than 24 hours. I had no idea Drunk Tailor and I would color coordinate so well. Also, Dat Hat. 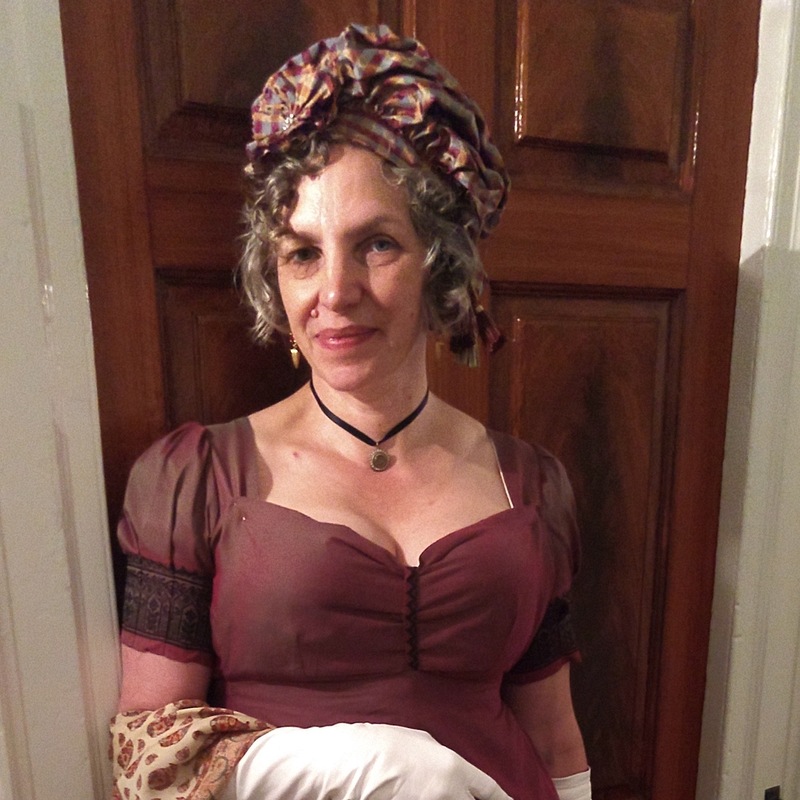 The fabric is left over from a gown I made to wear to a dance in Salem one spring, , but which happily coordinated well enough with the sari gown made for a photoshoot, and also worn to Salem for a dance. 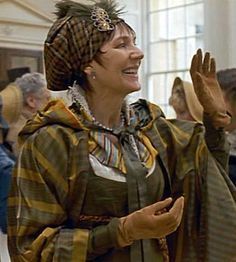 Briefly, the cap is made from scraps, ornamented with a two-layered rosette centered with a paste button, with the bulk of the caul gathered up and stitched down to hold the shape and embellished with three coordinating tassels looped onto a gold silk-wrapped cord. In the end, not too resting Bingley face, and a satisfactory cover for what I’ll call my hair a la Titus when I’m not in the current century. Drunk Tailor’s hat covered, somewhat, here. Sometimes this is a hard hobby to love. My hands hurt, my creativity feels dead, and there’s no place to go all dressed up. After a long, unpleasant spring, I finally feel like sewing and playing. Drunk Tailor and I definitely missed some things we very much wanted to do, but now we’re reinspired, we could take baby steps back to our normal semi-hectic pace– except of course, we are plunging back in with three events in August after a whirlwind trip to Ticonderoga. Wedding dress in cotton muslin ca. 1797. Nationalmuseet Danmark. Next up: an open robe or wrap-front gown over a matching petticoat, trimmed in blue-and-white Greek key trim, with a pair of pointy-toed ribbon-tied slippers and a sleeveless blue silk waistcoat, in three weeks or so. 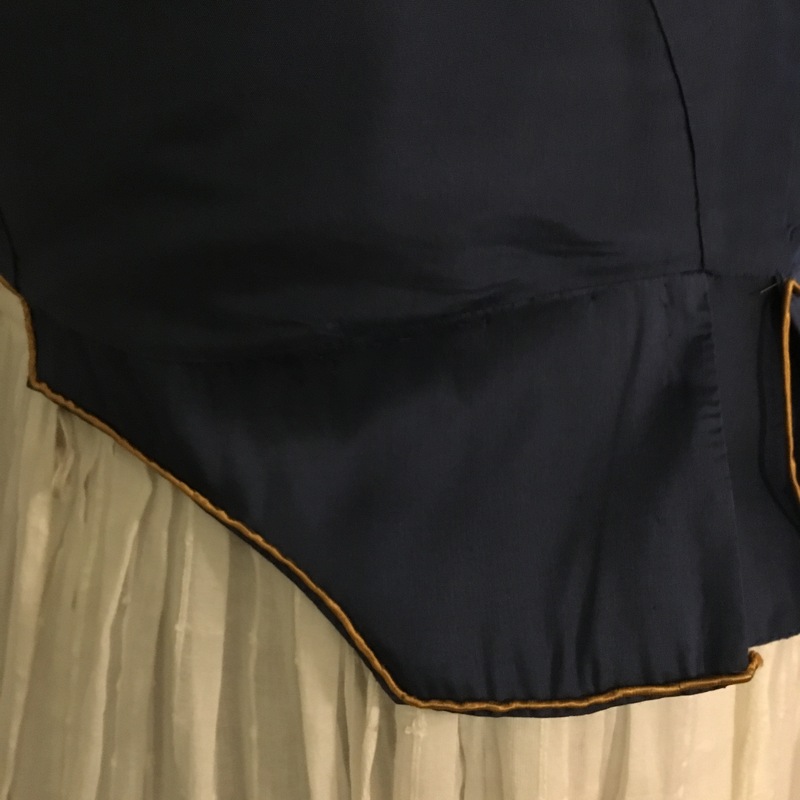 The waistcoat construction is finished, scaled up from the original garment patterned in the DAR’s “An Agreeable Tyrant” catalog. 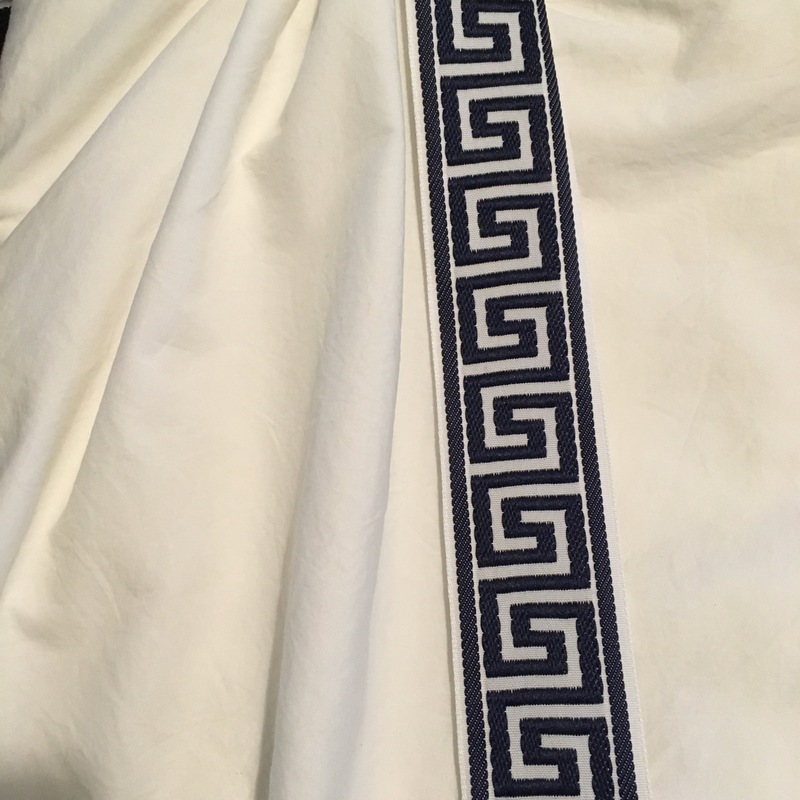 I chose to line mine, possibly from pure habit of making men’s clothing, possibly because I’m not that great a teeny-tiny hemming and require a lining to hide my sins. With gold silk cord trim and covered buttons, I think it will have a pleasantly military vibe. For the gown and petticoat, cotton in Virginia’s August heat seems like a solid choice, though by the time the layers are on and the sun is up, it’s possible that nothing will be really cool. (The majority of the day will be spent in air conditioning, so really, anything would be okay.) The trim arrived last night, and has a body that will need batiste (and not voile) for support. The combination causes me to entertain fears that this aesthetic is a little too boat-shoes-and-belts-with-embroidered-whales for 1797-1799, but when topped with something not unlike Drunk Tailor’s militia cap, the aesthetic will tilt from yachting to the Good Ship Lollipop.